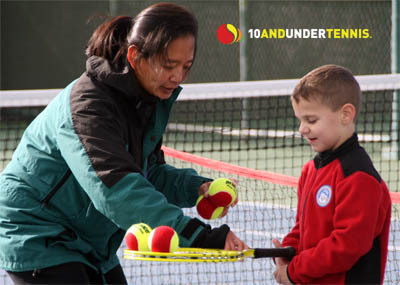 There will be a special 10 & Under Tennis Workshop held Saturday, Feb. 25 in Chandler, Ariz. This three-and-a-half-hour session (11:30 am - 3 pm) is being taught specifically to beginning tennis teachers, volunteers, recreational and parent coaches interested in working with 10 and under youths while implementing the QuickStart play format. Attendees will receive on-court training from a certified national trainer, along with practice and play plans that can be taken back and used for any practice or clinics with youths. For more information and to RSVP for the workshop please contact Ashley Redman at tsr@phoenixtennis.com. You can also call (480) 639-6704 for more details on the workshop. Cost is $15 to attend. The Chandler Tennis Center is located at 2250 South McQueen Road in Chandler, Arizona.